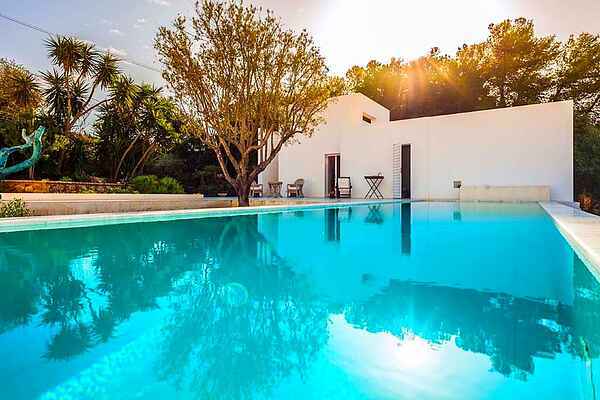 Pinivilla is a modern villa with swimming pool situated just a few hundred metres from the sea and the beautiful sandy beach of Cornino, a small fishing village halfway between San Vito Lo Capo and Trapani. This newly built villa, designed with straight lines and essential shapes, enjoys lovely views of the Mount Cofano and the sea. The house is on one level and is framed by a delightful garden with a splendid pool and two large, well-equipped terraces (dining area, outdoor kitchen, bbq). Furnished with taste and elegant simplicity, it includes two double bedrooms, two bathrooms, a sitting room and a kitchen and comes with internet Wi-Fi, satellite TV, air conditioning and washing machine. Villa dei Pini is also a great base for visiting the beauties of the surrounding area such as Erice, Trapani, Marsala, the Egadis, the Zingaro nature reserve and the archaeological sites of Segesta, Mothia and Selinunte. Ideal location to discover Sicily, the beautiful Italian island. For those who want to spend seaside holidays the coast is only 1 km away and there are plenty of beaches to choose from, the sea is beautiful everywhere! The cities you are recommended to visit during your stay are Erice (15 km), Trapani (18 km), San Vito lo Capo (20 km) and Segesta (40 km). A bit farther there is Palermo's capital of the region, which is worth a visit even a day. Try the 'arancini'!